There are many types of padded armor and gambesons. Padded armor was worn under mail shirts and plate armor to protect against injuries. Foot soldiers usually wore only an arming jacket or gambeson without any other armor. If you attend historical battle re-enactments or LARP, these padded garments will be an integral part of your knight's equipment. Worn under both the helmet and the mail hood, the Arming Cap offered extra cushioning for the head, and absorbed some of the sweat. Our Gambeson in Black has a buckle front closure with open armpits, providing mobility and ventilation. Crafted in heavy-duty padded canvas, it has excellent blow absorbing properties and is functional and battle ready. 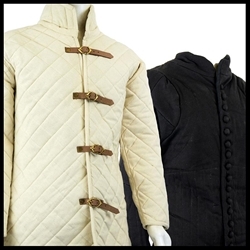 This Gambeson has a buckle front closure with open armpits, providing mobility and ventilation. Crafted in heavy-duty padded canvas, it has excellent blow-absorbing properties and is battle ready. This Gambeson has a buckle front closure with open armpits, providing mobility and ventilation. Crafted in heavy-duty padded canvas, it has excellent blow absorbing properties. Functional and battle ready. Crusader Upper Leg Padding with reinforced leather knee. Can be worn alone or with chainmail chausses or plate armor. Attaches to belt and laces up the back. Crusades to Renaissance arming wear. This Early Medieval Cotton Gambeson is a padded garment worn under a mail shirt, greatly reducing the risk of injuries in sparring or fencing. Made from 100% cotton, hand wash. These aiglets of brass are sewn and fitted to cotton cords. They can be used with gambesons, arming doublets and other garments of the Medieval and Renaissance period. This Gambeson is manufactured with heavy cotton canvas shell, lined with cotton and padded with a wool blend for reinforcement. Padded Arming Cap - Worn under both the helmet and the mail hood, the arming cap offered extra cushioning for the head, and absorbed some of the sweat. Our Padded Medieval Arming Coif is made from heavy, grey, cotton fabric with double tie front. This hood can be worn with many different helmets. Hand wash, hang dry. The arming cap is worn under a helmet and/or a mail coif, offering extra cushioning for the head. The Padded Arming Cap, worn under mail coifs and helmets, provides both scalp protection against abrasion and a certain amount of shock absorption. This Gambeson has a buckle front closure and open armpits. Crafted in heavy-duty padded canvas, it has excellent blow absorbing properties and is battle ready. This Gambeson has a buckle front closures and open armpits. Crafted in heavy-duty padded canvas, has excellent blow absorbing properties and is Functional and battle ready arming wear. Arming Caps are worn under mail coifs and helmets, providing both scalp protection against abrasion and a shock absorption. From padded canvas with neck ties. Functional Arming Wear. Our Padded Collar, in natural, provides thick padding to protect the collar, lower neck and upper chest. Our Padded Collar, in black, provides thick padding to protect the collar, lower neck and upper chest. This style of medieval gambeson has tie closures in front with reinforced eyelets. Removable sleeves the gambeson has plenty of (points) to attach various parts of plate armor. Crafted in heavy-duty padded canvas.